Senator Kirsten Gillibrand has endorsed Councilman Peter Bujanow in his bid for re-election to the Kinderhook Town Board. Senator Gillibrand cited Bujanow’s advocacy for the people of the Town of Kinderhook as well as his commitment to fair and effective government. “I share Senator Gillibrand’s strong commitment to fair and effective government, and I am deeply honored to receive her endorsement for re-election”, Bujanow said. “Senator Gillibrand is one of our nation’s most hardworking and effective senators and her record of public service is a model for all elected officials to emulate,” said Bujanow. “She understands that government needs to be sound, strong and work for the people it represents in these fiscally difficult times to create jobs, promote economic development and improve the quality of life for our residents." About the endorsement Cyndy Hall, Columbia County Democratic Committee Chair said, "Senator Gillibrand’s endorsement of Peter Bujanow emphasizes that he is the most qualified and experienced candidate for Kinderhook Town Council. Mr. Bujanow will continue to be an outspoken and passionate leader working in the best interest of all residents of the Town of Kinderhook. 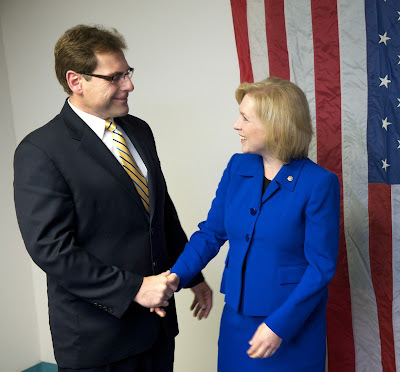 We are honored that Senator Gillibrand has endorsed Councilman Bujanow and we thank the Senator for her support." Peter Bujanow has served as a Kinderhook Town Councilman for a total of eleven years, from 1995 to 2001 and from 2008 to present. Among his many activities during his tenure on the Town Board, he was Deputy Town Supervisor from 2000 to 2001, and has chaired numerous Town Committees including Comprehensive Plan Implementation, Comprehensive Plan Review, Energy, Local Law and Code Review. In 2006, Councilman Bujanow also volunteered his time as Project Coordinator to manage the construction of the New Town Highway Garage Building.